Opening a tin of the new D'Crossier Selection No. 512, you may half expect a face-full of spring loaded snakes to catch you off guard, or possibly even an assortment of fancy nuts awaiting you on the inside. This is not the case, in fact, concealed within the uniquely packaged tin are freshly-sealed, premium cigars that may just become your next go-to cigar! D'Crossier Cigars is a brand best known for their classic profile, attention to detail, and refined qualities derived from supreme aging techniques. 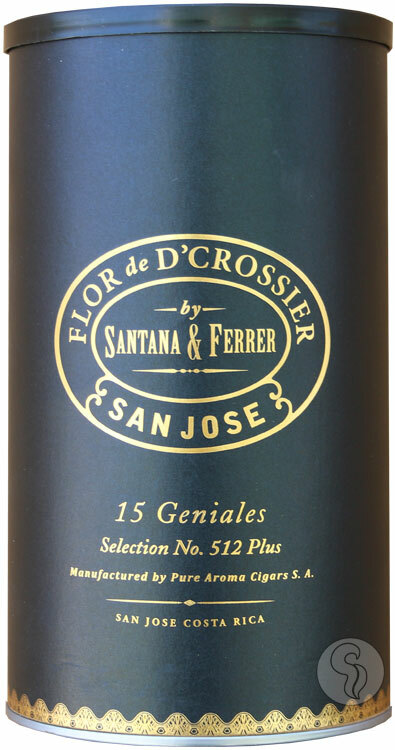 For their latest project, Flor de D'Corssier Selection No. 512, the cigars are offered in a revolutionary new packaging. Tin canisters are lined with aromatic Spanish Cedar, holding bundles of 15 - 20 cigars. Cigars are protected by cellophane sleeves that have been punched to allow proper aging of the tobaccos. Opening a can of D'Crossier Selection No. 512 may feel reminiscent of a tin of peanuts, but the result couldn't be more distant. The cigars showcase balanced and complex flavors of salted butter, cream, savory oils, cedar, and pepper spice to tie the smoking experience together. This may be one of the finest cigars in the affordable price range!